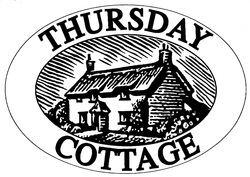 Thursday Cottage was started in 1963 in a cottage of the same name outside Spaxton, Somerset. For many years, the business was then owned and run by Hugh and Pam Corbin from Lyme Regis, until they sold it to us in 2002. We are now based at Trewlands Farm in Tiptree, Essex, where we still operate a small production unit where a variety of different preserves, curds and marmalades are made by hand. The ingredients, the open pan cooking and our products' distinctive taste and character are little changed from when the company was based in the West Country. We take great care in the choosing the best ingredients and grow a variety of traditional and unusual fruit close to our production kitchen. All our products are made in small batches. We fill by hand when we can because it keeps the fruit whole and we believe, makes a better product. Perhaps the proof is in the pudding? In the 2010 Great Taste Awards, our Damson Coulis won the Midlands and East Anglian Speciality Product of the Year - one of only 15 regional winners countrywide from over 5000 entrants. We are very proud of this accolade, just as we are of the many other gold awards over the past decade. ​Today the business is run by Walter Scott, ably assisted by Donna Smith and a small but extremely dedicated production team led by Ania Paxton. Pam remains very involved in new product development and in particular acts as our 'recipe police', ensuring we are constantly improving our many preserves when we can. Our aim is to produce widely available classic products that are as good, if not better, than home made. We hope you enjoy our products as much as we enjoy making them.